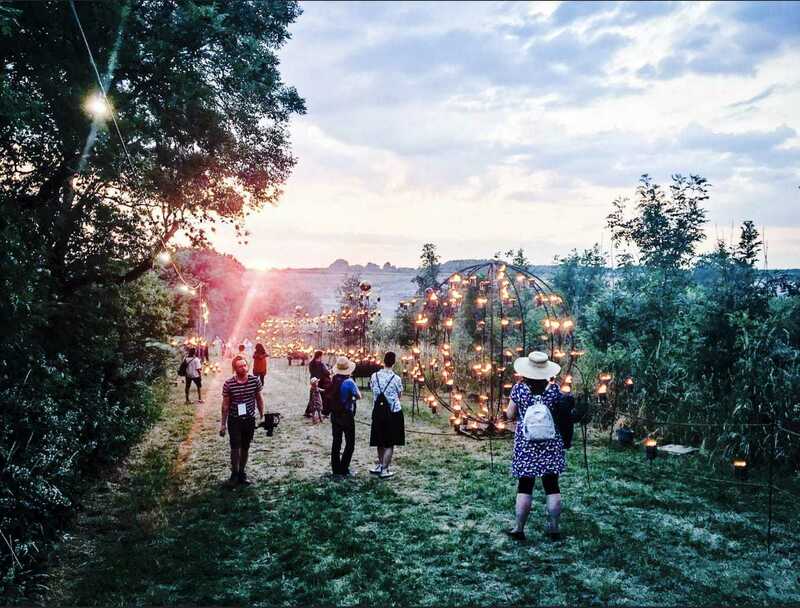 Towersey Festival reaches the grand old age of 55 next year, making it one of the most longstanding festivals in the UK. 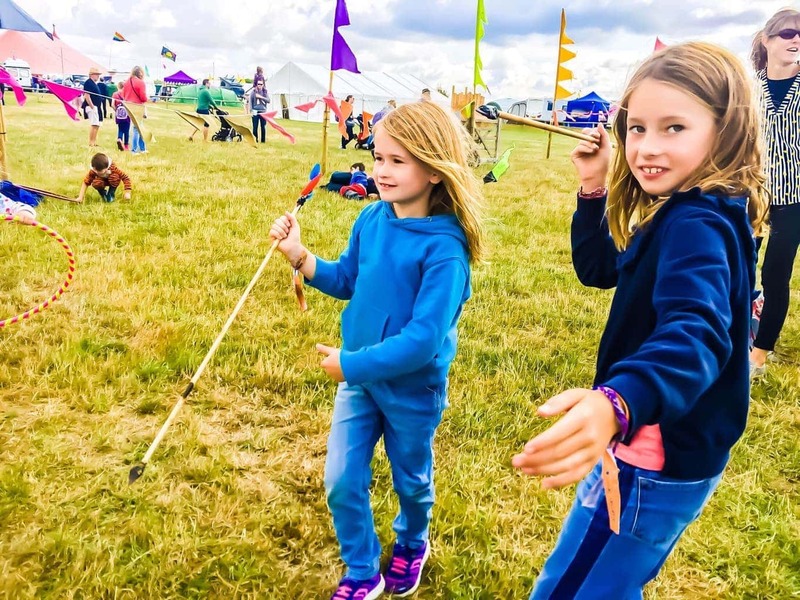 From humble beginnings in a Pub Barn, Towersey Festival is now based in the Show Grounds of Thame in Oxfordshire, and attracts around 10,000 visitors. 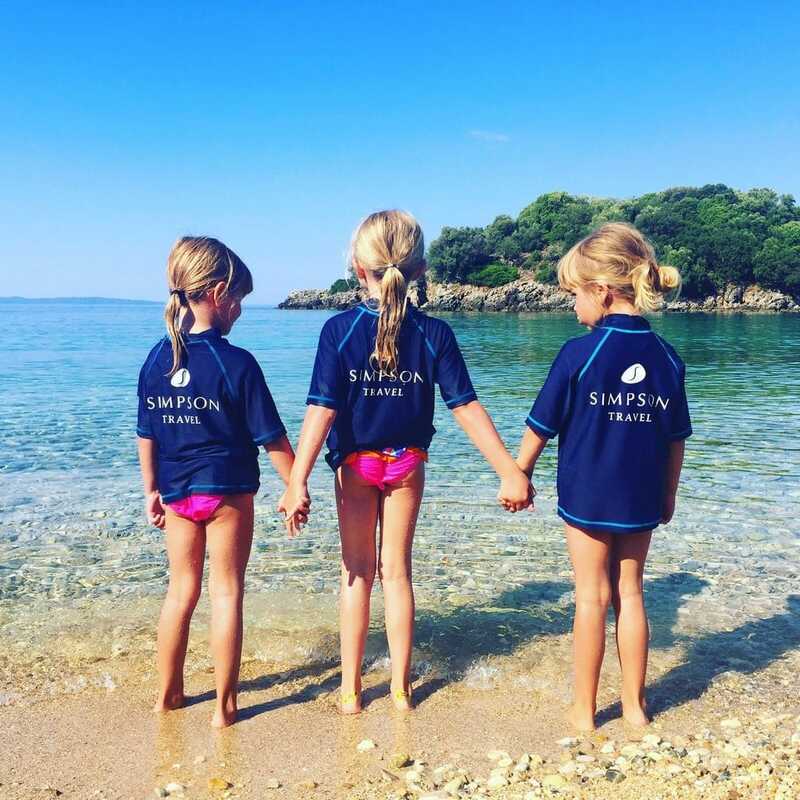 Many families return year after year, introducing new generations to Towersey as they go. My family enjoyed a wonderful first weekend at Towersey Festival, helped by the warmth of the welcome we felt throughout the weekend. As with many an August Bank Holiday, the weather forecast was mixed. Towersey Festival started on Thursday and ran right through to Bank Holiday Monday. My husband had to work on Friday, but the children and I could wait no longer. We piled our camping essentials and much loved Bell Tent into the car and headed to Towersey with a great sense of in-trepidation. This would be our third time camping as a family, and the first time I had erected the tent alone, or rather not so much alone, but with three small children. 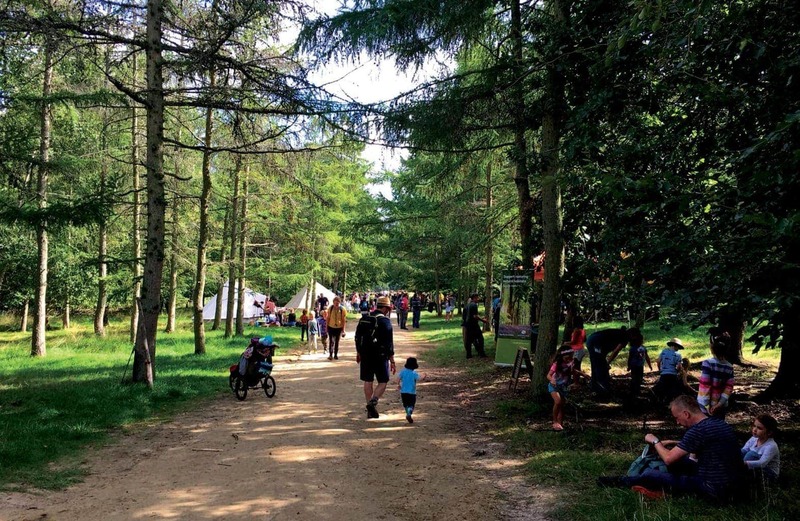 We had been tipped off that the camping areas would be busy by Friday as very-committed Festival goers queued before the festival even opened to get their favourite camping spot. 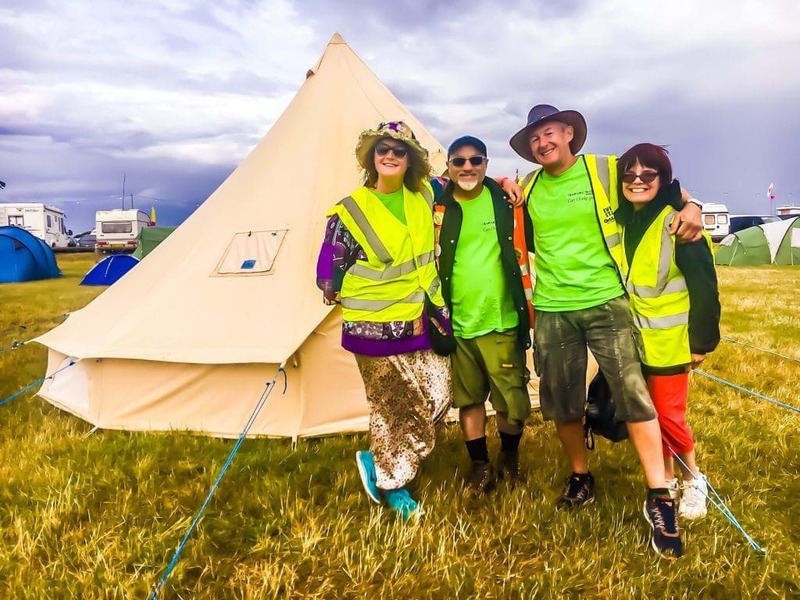 Being new to Towersey Festival, I sought the advice of the friendly ‘camping in’ team marshals who greeted us with big smiles as we arrived. My requirements were space for a 5 metre bell tent, not too near the ‘late night’ camping, but not too far from the children’s entertainment. The stewards radioed their colleagues to find a suitable spot and, after noting I was alone with three small children and a large bell tent in a fast approaching gale, stewards came flocking to help. I had hoped to write about triumphantly single-handedly erecting a bell tent with three small children, but instead I am very happy to write about the triumph of kindness and human spirit that meant that my tent went up very quickly. My children watched on from the warm dry car, and my lucky husband avoided all the drama and joined us that evening on the train from London . The ‘camping in’ team not only helped me erect the tent, but found us the perfect location. We had plenty of space, weren’t too close to any of the late-night venues, and were right opposite a large marquee named ‘All About Children’. 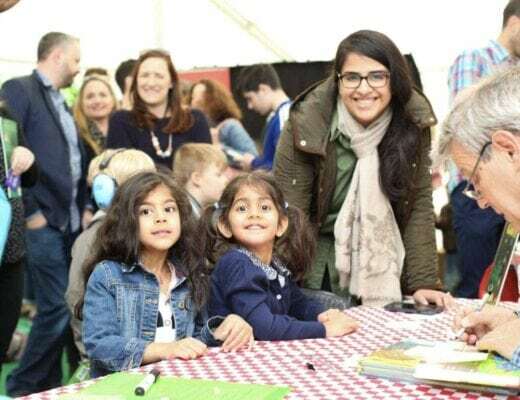 At 10am every day the children popped over tp the marquee and choose from several different ‘table-top craft’ activities, including metal work, sewing, collage and rocket making. 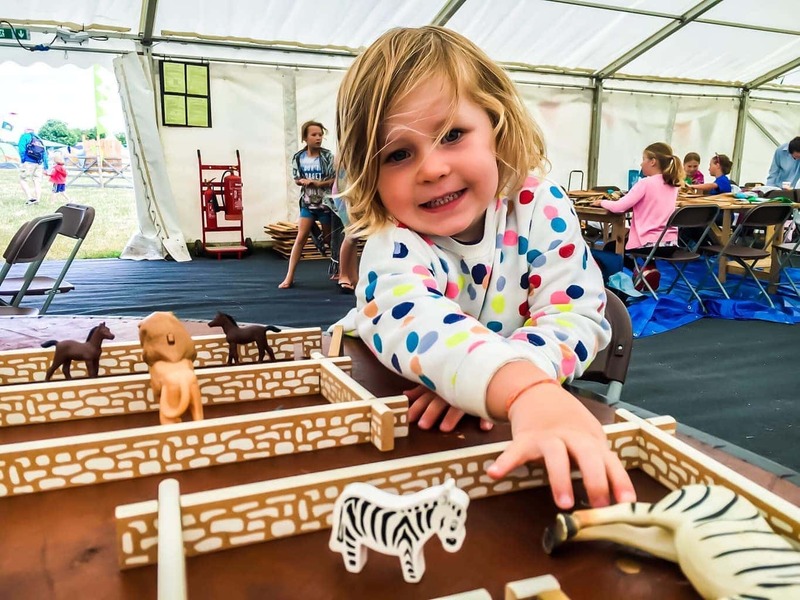 Most activities were aimed around age 8 and above, but our three year did not miss out as there were also tables of colouring, drawing, and model animals for her to play with. If this wasn’t enough, the neighbouring tent had a play kitchen and piles of children’s books, open all day for families to pop in and out of. Alongside, the workshop tent hosted family yoga and kinder-gym, which our youngest loved. As an alternative to crafting, bush craft sessions were run every morning and my eldest two particularly enjoyed whittling their own spears. In the afternoon there were children’s music workshops offering the chance to try everything from ukulele to squeeze boxes. 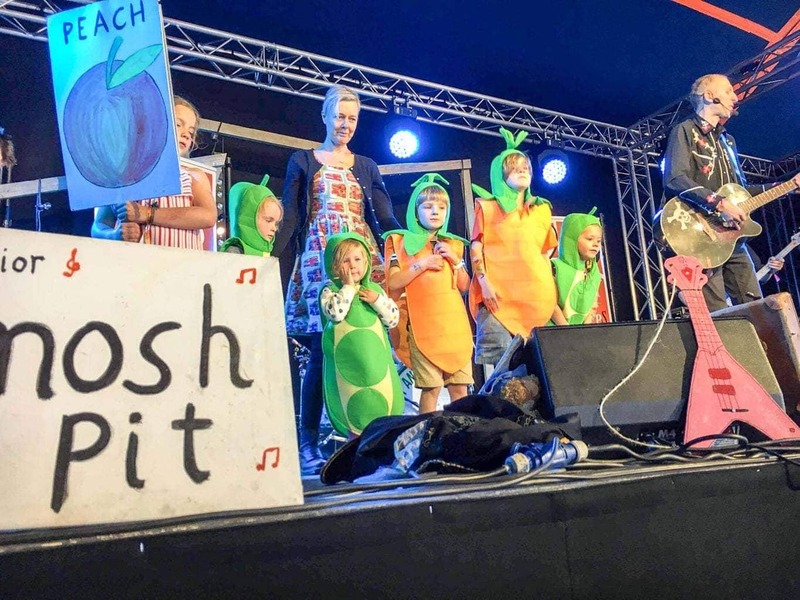 Many of the music workshops were progressive, so if you attended throughout the festival you could perform on the Monday in various Towersey bands and choirs. The crafting also continued into the afternoon too, with lanterns, clay modelling, paper kites and light jars being constructed. 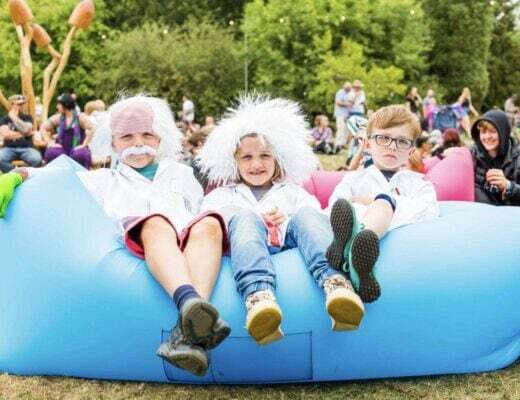 As the evening began there were Children’s Entertainers, comedians and theatre followed by bed-time stories, although many of the children were not off to bed, but to continue the fun up in the main Festival Green. The Festival Green played host to a series of large marquees; including Venue 65, where we saw the Proclaimers and Big Country play on Saturday night, and we stumbled upon a great band called the CC Smugglers playing on Friday evening. In the slightly smaller Big Club tent my youngest made her stage debut as a pea, with the wonderfully entertaining Johnny and the Raindrops. The Festival Dance Tent hosted Ceilidhs almost continuously over the weekend, pausing only for the occasional Salsa lesson. My eldest two daughters and I managed to squeeze onto the dance floor during the late night Ceilidh session and they quickly learnt to ‘Strip the Willow’ and ‘Dosey Doe’. Having grown-up in rural England myself, it hadn’t occurred to me that my suburban-born daughters had never seen Morris Dancing, which they watched with delight in the Market Square. In amongst all the music and dancing there were also magicians, story tellers and a range of workshops. 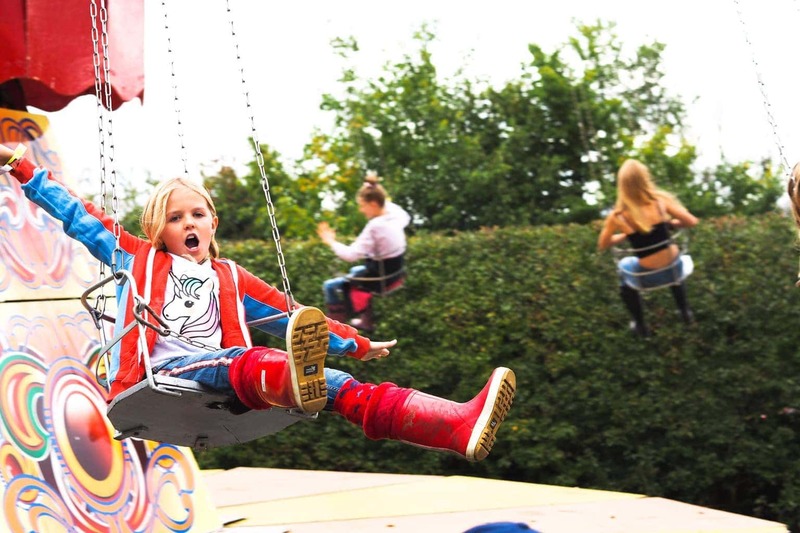 There were more crafts, dressing up, circus skills and face painting available for children in the main Festival Green, alongside a ferris wheel and trampolines. The Towersey Festival programme was packed full. Thankfully there was an App available to help find our favourite sessions, but I would also recommend buying a printed programme and seeking advice of some of the many volunteers about what might work best for your family. There were plenty of food stalls dotted around the site, so there is really no need to cook at your campsite unless you want to. Predictably the best stalls would have long queues at peak times and many would only take cash (which was available as cash back in the main bar off needed). 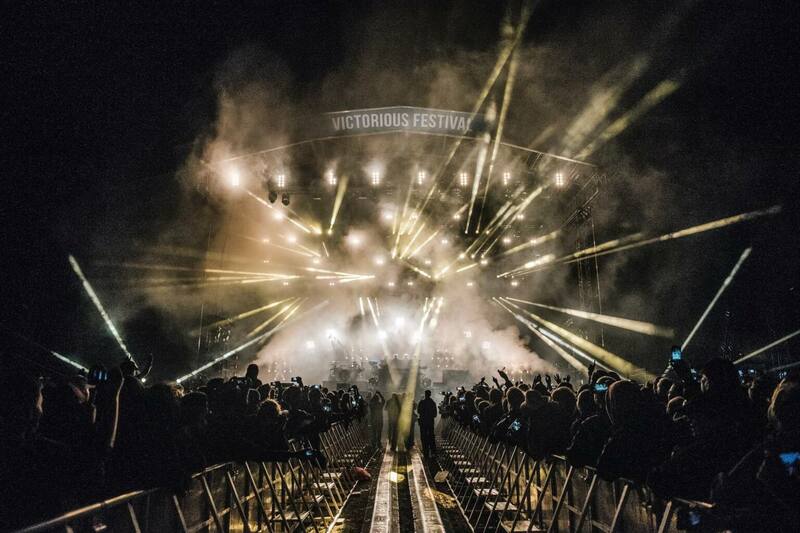 If you want to be part of the 55th Towersey Festival, tickets for 2019 are already available at www.towerseyfestival.com. Lucy and her family received complimentary tickets for Towesey Festival, but their opinions are their own. 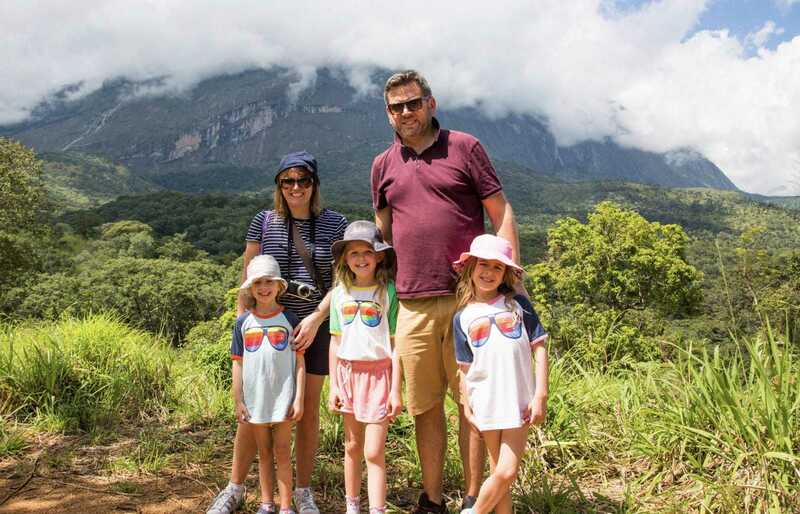 Next Post Gorilla Trekking in Rwanda and Kids!